ABSTRACT. Posttransplant diabetes mellitus (PTDM) remains a common complication of immunosuppression. Although multiple risk factors have been implicated, none have been clearly identified as predisposing to the increased PTDM frequency observed in patients on tacrolimus. Hepatitis C virus (HCV) has been associated with diabetes and is a significant renal transplant comorbidity. In this study, records of 427 kidney recipients who had no known diabetes before transplantation were retrospectively examined. A multivariate logistic regression model was fit with covariates that had unadjusted relationships with PTDM to examine the independent relationship of HCV and the odds of development of PTDM by 12 mo posttransplant. A potential interaction between HCV and the use of tacrolimus as maintenance therapy on the odds of the development of PTDM was examined. Overall, PTDM occurred more frequently in HCV+ than HCV− patients (39.4% versus 9.8%; P = 0.0005). By multivariate logistic regression, HCV (adjusted odds ratio [OR], 5.58; 95% confidence interval [CI], 2.63 to 11.83; P = 0.0001), weight at transplantation (adjusted OR 1.028; 95% CI, 1.00 to 1.05; P = 0.001), and tacrolimus (adjusted OR, 2.85; 95% CI, 1.01 to 5.28; P = 0.047) were associated with PTDM. A significant interaction (P = 0.0001) was detected between HCV status and tacrolimus use for the odds of PTDM. Among the HCV+ cohort, PTDM occurred more often in tacrolimus-treated than cyclosporine A–treated patients (57.8% versus 7.7%; P < 0.0001). PTDM rates in HCV− patients were similar between the two calcineurin inhibitors (10.0% versus 9.4%; P = 0.521, tacrolimus versus cyclosporine A). In conclusion, HCV is strongly associated with PTDM in renal transplant recipients and appears to account for the increased diabetogenicity observed with tacrolimus. Although advances in immunosuppression have resulted in increasingly successful renal transplant outcomes over the past two decades, posttransplant diabetes mellitus (PTDM) remains a serious and undesirable complication of this therapy (reviewed in reference (1). The long-term consequences of PTDM include an increased risk of death from sepsis, a greater risk of graft failure, and the development of diabetic nephropathy in the transplanted kidney 2–4). Moreover, it is likely that PTDM contributes to the excessive cardiovascular mortality observed in renal allograft recipients (5), by virtue of the accompanying hyperglycemia and frequently occurring hyperinsulinemia. In the pre-cyclosporine era, chronic high-dose steroid therapy was a major contributing factor to the development of PTDM (6–8). However, despite the introduction into the renal transplant clinical arena of steroid-sparing therapies such as cyclosporine A (CyA) and, subsequently, tacrolimus, the incidence of PTDM has continued to increase over the past 20 yr (2,3,9–12). Initial studies designed to compare the relative immunosuppressive efficacies of CyA and tacrolimus in renal transplant patients have demonstrated a greater risk of PTDM in the tacrolimus-treated subjects, with reported frequencies ranging between 8 to 25% (11,13). More recently, however, efficacy studies of combination therapy with tacrolimus and mycophenolate mofetil (MMF) have documented lower rates of this complication (14–17). There is evidence that the major mechanism underlying the diabetogenic effect of tacrolimus encompasses both impaired insulin secretion secondary to islet cell toxicity, as well as insulin resistance (18–20). Besides the use of predisposing immunosuppressive drugs, the most well recognized risk factors for PTDM include older age, increasing body mass index, and black race (reviewed in reference 1). Recently, an increased prevalence of diabetes mellitus has also been observed in individuals infected with hepatitis C virus (HCV), both in the general population, as well as in patients with advanced liver disease before and after transplantation (21–23). In renal transplant patients, HCV infection has been reported to occur with a frequency ranging from 10 to 40% and is associated with an increased risk of both allograft failure and mortality (24,25). There is limited information to date regarding the association of PTDM with HCV in this population group (26). Against this background, the purpose of this study was twofold. First, the re-examination of the risk factors for PTDM in the era of more contemporary immunosuppression; second, the establishment of whether any association exists between HCV and PTDM in renal allograft recipients. We have retrospectively examined outpatient medical records from 427 renal allograft recipients who received transplants between July 1995 and July 2000 and who did not have a history of diabetes mellitus before transplantation. Subjects comprised patients who received renal transplants at three different transplant centers in the Philadelphia region, Albert Einstein Medical Center, Hahnemann University Hospital, and Hospital of the University of Pennsylvania. All subjects had a minimum of 6 mo of posttransplant follow-up. Cadaveric renal transplant patients with delayed graft function received induction therapy with anti-CD3 monoclonal antibody (OKT3; Ortho Pharmaceuticals, Raritan Bay, New Jersey) or antithymocyte γ-globulin (ATGAM; Upjohn, Kalamazoo, Michigan or Thymoglobulin; Sangstat Medical Corporation, Menlo Park, CA). Calcineurin inhibition (tacrolimus [Prograf, Fujisawa, Bloomington, IL] or CyA [Neoral, Novartis, East Hanover, NJ]) was started when the serum creatinine began falling or by day 7, whichever event occurred first. Recipients of cadaveric allografts experiencing immediate function and all recipients of living donor kidneys received calcineurin inhibition from the time of transplantation. Target tacrolimus and CyA levels were as follows: (1) months 1 to 3: 10 to 15 ng/ml for tacrolimus and 250 to 350 ng/ml for CyA; (2) months 3 to 6: 8 to 12 ng/ml for tacrolimus and 200 to 300 ng/ml for CyA; and (3) beyond 6 mo: 5 to 10 ng/ml for tacrolimus and 100 to 200 ng/ml for CyA. Additional maintenance immunosuppression included MMF (Cellcept, Hoffman-La Roche, Nutley, NJ) at 1 to 2 g/d in divided doses for all patients on tacrolimus and for white patients on CyA and 2 to 3 g/d for African American patients on CyA. Dosages were downwardly titrated for any adverse drug reactions. Azathioprine was used before the approval of MMF and subsequently as a substitute wherever patients were deemed intolerant to MMF. Steroids were initially given as bolus methyl prednisone doses of 50 to 1000 mg intraoperatively. Prednisone was introduced by day 1 to 2 postoperatively and was tapered according to the protocols of each center, generally to 10 mg daily by the end of the third postoperative month. MMF and azathioprine were adjusted to maintain the white blood cell count above 4 × 106/L. Acute renal allograft rejection was determined by the presence of clinical findings, including fever, reduction in urine output, weight gain, an increasing BP, graft tenderness, and a rising serum creatinine level. Almost all suspected cases of acute rejection were confirmed by percutaneous renal transplant biopsy before institution of antirejection treatment. Pulse methylprednisone (10 mg/kg) was used for mild cases of acute rejection, and OKT3TM was reserved for patients with more severe grades of, or steroid-resistant, rejection episodes. The immediate posttransplant management was the same for all patients. Ultrasound with Doppler flow studies or nuclear scans were performed within 24 h of the transplant to assess allograft blood flow and function. The Foley catheter was removed on the third postoperative day. The diet was gradually advanced as tolerated. All patients had blood glucose measurements performed routinely during the initial hospitalization at the time of transplantation. Blood glucose measurements were made every 12 h for the first 24 h after transplantation. Thereafter, blood glucose levels were measured daily while the recipient was an inpatient, twice weekly for the first posttransplant month as an outpatient, weekly for the second posttransplant month, and whenever patients had routine chemistry studies thereafter. PTDM was diagnosed according to American Diabetes Association guidelines (27). Briefly, diagnostic criteria include: (1) fasting blood sugar >126 mg/dl on 2 separate occasions; (2) random blood sugar >160 mg/dl, confirmed by fasting blood sugar >126 mg/dl; and (3) 2-h postprandial blood sugar >200 mg/dl, confirmed by fasting blood sugar >126 mg/dl. Patients with a diagnosis of PTDM were given a glucometer and instructed on monitoring blood sugars at home on a 2 to 4 times daily basis. Patients with fasting blood sugars of 130 to 180 received dietary restriction only as initial therapy; those patients refractory to diet control alone or those with fasting blood sugars of 180 to 250 were started on oral hypoglycemic agents; patients with fasting blood sugars >250 or those unresponsive to oral hypoglycemic agents were started on insulin subcutaneously. Recipient age, gender, race, pretransplant weight, pretransplant HCV serologic status, cause of ESRD, and previous renal transplant history were recorded. Posttransplant data were collected on the occurrence of rejection, therapy for rejection, and immunosuppressive medications at the time of discharge from the index hospital admission. Means of continuous data between subjects who had PTDM and who did not have PTDM were compared by ANOVA methods, and categorical variables were compared using either the χ2 test or Fisher’s exact test when data were sparse. A multivariate logistic regression model was fit in a forward fashion with the variables that had a significant unadjusted association (P < 0.10) with the development of PTDM to examine the independent association of HCV positivity and PTDM. Variables were retained in the model if P ≤ 0.05 by the Wald test. We extended this model to explore for a relationship between HCV status and tacrolimus use at the time of transplantation by including an interaction term that combined both these variables. To account for the potential confounding effect of steroid use, a time-varying exposure, with the development of PTDM, we fit a second model in a similar fashion that was conditioned on the PTDM-free survival of subjects for 1 mo posttransplant. In this model, the cumulative dosage of prednisolone equivalent by 1 mo was fit. All P values were two-sided, and all analyses were performed using SPSS software (SPSS Inc, Chicago, Illinois). Among this cohort of 427 patients with no prior history of diabetes, 308 (72.1%) were recipients of cadaveric kidneys, 139 (32.6%) were black, 255 (59.7%) were men, and 71 (16.6%) were known to be HCV+ pretransplant. The primary calcineurin inhibitor was tacrolimus in 290 patients (67.9%) and was used with a similar frequency in blacks and non-blacks (68.3% versus 67.7%; P = 0.493). The overall occurrence rate of PTDM was 14.8% (63 of 427). These above frequencies are all in accord with similar series or reports published elsewhere (11,12,25,28). PTDM occurred in 35 (9.8%) of 356 patients who were HCV− and in 28 (39.4%) of 71 patients infected with hepatitis C (P < 0.0001 between groups). The median time to development of DM after transplantation was 42.0 ± 14.7 d (30 ± 23.1 d among HCV− and 42 ± 9.7 d among HCV+ patients; P = 0.700). An unadjusted analysis of the entire patient cohort according to the presence or absence of PTDM is shown in Table 1. Patients who developed PTDM weighed more at the time of transplantation, were significantly older, and were more commonly black and male. The frequency of autosomal-dominant polycystic kidney disease, a previously associated risk factor for PTDM (29), was not different between the two groups. Notably, HCV+ infection was observed almost four times more frequently in the PTDM cohort than in the patients without diabetes (44.4% versus 11.8%; P < 0.0001). Acute rejection rates and the use of pulse methylprednisone was similar between the two groups. The mean (± SD) cumulative maintenance steroid dosage at 1 mo, available in 279 patients, was similar in the PTDM and non-PTDM cohorts (1190 ± 54.9 mg versus 1278 ± 52.9 mg, respectively; P = 0.498). Of the 63 patients with PTDM, the majority received tacrolimus, as opposed to CyA, at the time of developing this complication (80.9% on tacrolimus versus 19.1% on CyA; P < 0.001). Because of the hypothesis that HCV positivity increases the risk of PTDM, we next examined the characteristics of patients with PTDM according to their HCV status (Table 2 and Figure 1). In an unadjusted analysis, there was a two-fold increase in the frequency of black patients among HCV+ patients with PTDM compared with their HCV− counterparts (60.7% versus 31.4%; P = 0.019). On the other hand, the mean recipient age and weight at the time of transplantation was not significantly different between the two PTDM subgroups. Significantly more patients in the HCV+ cohort were on tacrolimus at the time of diagnosis (92.9% versus 71.4% in HCV− patients; P = 0.031). Among the PTDM patients receiving tacrolimus, the mean (± SD) serum trough concentrations at discharge, 1 mo and 3 mo after transplantation were not significantly different between subjects with and without HCV (13.1 ± 2.2 versus 13.4 ± 1.8 ng/ml at discharge, P = 0.916; 12.4 ± 2.7 versus 10.2 ± 0.7 ng/ml at 1 mo, P = 0.644; 12.9 ± 1.8 versus 10.3 ± 0.8 ng/ml at 3 mo, P = 0.216). Figure 1. Hepatitis C virus (HCV) is a major risk factor for posttransplant diabetes mellitus (PTDM) in tacrolimus-treated renal transplant recipients. The entire patient population was examined for the development of PTDM according to their HCV status and the calcineurin inhibitor they were taking. The actual frequencies among the HCV− group were 10 of 103 for CyA-treated patients and 25 of 253 for tacrolimus-treated patients (P = 0.521 between the two treatment groups); in the HCV+ cohort, the frequencies were 2 of 26 for individuals on CyA and 26 of 45 for those on tacrolimus. aP < 0.0001 versus CyA-treated HCV+ patients. Figure 1 examines the incidence of PTDM according to HCV status and use of calcineurin inhibitor. As shown in Figure 1, the incidence of PTDM among all HCV− recipients overall did not significantly differ between the calcineurin inhibitors, occurring in 10 of 106 patients receiving CyA and 25 of 250 patients being treated with tacrolimus (9.4% versus 10.0%; P = 0.521). In contrast, among the HCV+ cohort, PTDM was observed almost eight times more frequently in patients treated with tacrolimus (26 [57.8%] of 45 patients) than CyA (2 [7.7%] of 26 patients; P < 0.0001). The incidence of PTDM in CyA-treated HCV+ recipients was not significantly different to that observed among the entire HCV− cohort, irrespective of which calcineurin inhibitor was used. A multivariate logistic regression model was fit in a forward fashion with all the following recipient covariates that had unadjusted associations (P < 0.10) with the development of PTDM: male gender, black race, age, weight at transplantation, tacrolimus use, and the presence of HCV+ serology (Table 3). In this model, tacrolimus use at the time of discharge after transplantation (odds ratio [OR], 2.31; confidence interval [CI], 1.01 to 5.28), pretransplant weight (OR, 1.028; CI 1.01 to 1.05), and HCV positivity (OR, 5.58; CI, 2.63 to 11.83) all remained significantly associated with PTDM. To account for the potential confounding effect of cumulative steroid dosing, a time-varying exposure, a second model conditioned on PTDM-free survival by 1 mo posttransplant, was fit with the same variables, as well as the cumulative maintenance steroid dose at 1 mo, available in 279 patients in the analysis (Table 4). 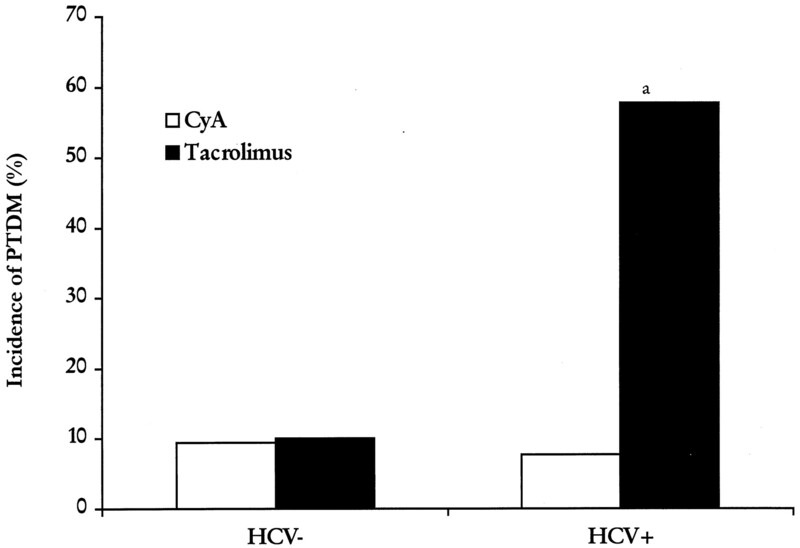 The association of tacrolimus use (OR, 5.46; CI, 1.26 to 23.72), weight at transplant (OR, 1.03; CI, 1.01 to 1.06), HCV positivity (OR, 6.76; CI 2.36 to 19.38), and development of PTDM persisted. The subsequent inclusion in both models of an interaction term that combined tacrolimus use at discharge with HCV seropositivity (P = 0.0001) supports the existence of a significant relationship between HCV and tacrolimus in predisposing to PTDM. In light of the high frequency of PTDM among tacrolimus-treated HCV+ individuals, we finally sought in a supplemental analysis to identify factors that may be implicated in predisposing this particular group of patients to the development of abnormal glucose tolerance (Table 5). Among these tacrolimus-treated HCV+ patients, those who developed PTDM were more likely to be male than those who did not develop PTDM. (88.5% versus 63.2%; P = 0.05). Age, patient race, weight at transplant, and trough tacrolimus concentrations at discharge 1 mo and 3 mo after transplantation were not significantly different between the subgroups. Of the 28 HCV+ patients with PTDM, 19 (73.1%) required insulin for management of their hyperglycemia, compared with 21 of 35 HCV− patients (60.0%; P = 0.196). At 1 yr after diagnosis of PTDM, none of the HCV+ patients were able to discontinue their insulin, despite conversion from tacrolimus to CyA in eight of these patients. PTDM successfully resolved in seven HCV− patients who were converted from tacrolimus to CyA. PTDM remains a frequently observed complication in the contemporary immunosuppressive era. In this article, we have demonstrated that HCV is associated with diabetes mellitus after renal transplantation, particularly among patients on tacrolimus-based immunosuppression. In the general population, there are several studies linking HCV to the development of diabetes (22). There are a few published reports in transplant populations, both liver and kidney transplant recipients (21,23,26,30). In these studies, the PTDM incidence has generally ranged from 20 to 30%. Unlike our series, in which both tacrolimus and CyA were each extensively used, the previous observational studies either used CyA alone, as was the case in the liver transplant patients, or did not specifically address calcineurin inhibitor use, as in the renal transplant studies. Besides recognizing the important association of HCV infection with PTDM in renal transplant recipients, our data has corroborated other well-recognized risk factors, including tacrolimus use and weight of the recipient at the time of transplantation. Interestingly, previous studies have observed an association of black race with PTDM. Our observations suggest that the relationship between race and PTDM is potentially confounded by HCV seropositivity, supported by our finding that among the patients with PTDM, there were significantly more black patients in the HCV+ than HCV− group (60.7% versus 31.4%, respectively; P = 0.019). The strong association of tacrolimus with PTDM is well recognized (11,13). Our data suggest that the increased diabetogenicity of this calcineurin inhibitor may be a function of the preexisting HCV status of the recipient. This is supported by the observation that the PTDM incidence among HCV+ subjects was over sevenfold higher in those treated with tacrolimus than those receiving CyA. In contrast, PTDM occurred at a similar rate in patients who were HCV−, regardless of which calcineurin inhibitor was used. The PTDM frequency in the HCV− group was not significantly different from that observed among CyA-treated HCV+ patients. Although this study provides strong evidence of an association between tacrolimus-induced PTDM and HCV, it does not give any insight into the possible underlying mechanism. Some investigators have previously observed that HCV+ patients have lower plasma insulin and c-peptide levels, as well as decreased insulin responsiveness and increased insulin resistance, when compared with patients without this chronic infection (31,32). Glucose intolerance is also commonly observed in patients with liver disease, due to multiple mechanisms including decreased peripheral glucose uptake, diminished hepatic glycogen formation, and insulin resistance [reviewed in reference (33]. On the other hand, the diabetogenicity of tacrolimus has been demonstrated, in both animals and humans, to be mediated through suppression of pancreatic insulin secretion 18,20). Extrapolating from the above mechanisms, we would speculate that many HCV+ patients on or near dialysis probably have barely normal glucose tolerance at baseline that may be masked in the setting of advanced renal failure. After immunosuppression with tacrolimus, their maximally compensated preexisting insulin levels that maintain euglycemia are suppressed, resulting in the development of frank diabetes. We recognize important limitations to our study. First, our data were retrospectively collected, and we have no information regarding HCV viral load and level of liver function. Moreover, during the period in which the above patients were listed for transplantation, there had been no uniform policy in the different programs to perform pretransplant liver biopsies. As a consequence the degree of histologic damage, a vital marker of severity of hepatic disease, is lacking in most patients and cannot be evaluated as an independent risk factor for PTDM. Second, pretransplant diabetes was screened for by history and baseline fasting blood sugars only; more sensitive studies, such as glucose tolerance testing and glycosylated hemoglobin and c-peptide levels, were generally not performed. Given, however, that the standard of screening was uniform for all patients, it is very unlikely that inconsistencies in the screening process could be responsible for observations made in this study. Third, even if there was channeling of tacrolimus during this period of observation, it would have been in the direction of physicians not to use tacrolimus in HCV+ recipients, leading to an underestimation of the effect of tacrolimus use on the risk of PTDM. Lastly, we cannot exclude the contribution of residual confounding to our findings from unmeasured factors. Despite these limitations, we believe that this study has important implications for application to the general renal transplant population. Tacrolimus should be used cautiously in HCV+ renal transplant patients and blood sugar levels should be closely monitored in the posttransplant period, at least weekly for the first few months, as recommended elsewhere (34,35). Consideration should be given to early conversion to CyA upon development of any degree of glucose intolerance in such patients. Our limited experience in this patient population shows that switching calcineurin inhibitors after the development of frank diabetes is ineffective in restoring euglycemia. Finally, the pretransplant evaluation for HCV+ individuals with renal failure should be modified to routinely include glucose tolerance testing as well as counseling about a higher diabetes risk on immunosuppression, particularly if this is going to be tacrolimus-based. In conclusion, this study has demonstrated a strong association between HCV and PTDM in renal transplant recipients, particularly those on tacrolimus-based maintenance immunosuppression from the time of transplantation. Importantly, in our study, tacrolimus does not appear to be associated with an increased risk of PTDM in recipients who do not have underlying HCV infection, which constitutes the majority of our patient population. The occurrence of PTDM predominantly among HCV+ patients and particularly among those taking tacrolimus suggests the need for further prospective studies that take the HCV viral load and degree of histologic liver damage into account, as well as metabolic evaluations of glucose handling. By further refining and identifying these potential risk factors for PTDM, this undesirable complication could potentially be minimized.